The NISMO Fiesta is the party of the year for Nissan owners and enthusiasts. The annual festival gathers Nissan fans from all around the country united by their common passion. This year, eight of Nissan’s own journeyed from the headquarters in Nashville to San Marcos, Texas to participate. After 920 miles, two days, and one pit stop at a Louisiana dealership, the gang arrived in San Marcos in time for the first day of the weekend’s festivities. “We are car enthusiasts ourselves – so much so that we wanted to drive 1,000 miles in the cars that we promote,” said Max Moosman, one of the road-trippers and a member of Nissan’s Social Media team. On Saturday, NISMO Fiesta attendees enjoyed a day at the track, testing the limits of their vehicles. Sunday featured a car show and the display of Nissan’s new 2015 GT-R NISMO. It sounds like Nissan’s team had a great time. We at Cronic Nissan may have to make the trip for next year’s event. When you’re in a competitive segment like the crossover SUV class, it’s important to have a certain “wow” factor to attract customers, which can take a lot of work. For the 2014 Nissan Murano, the characteristic that sets it apart from its rivals is its unique, aerodynamic design. Over the course of its development, the new Murano was subjected to three times the normal wind tunnel testing, allowing for the Murano design to be as streamlined as possible. This extensive testing resulted in the crossover achieving a 0.31 coefficient of drag, making it as aerodynamic as many sports car. This number makes it the best-in-class when it comes to the midsize crossover segment. Along with this aerodynamic look, designers also strived to keep the original Murano’s strong sculptural qualities, which add a sexiness that can’t be ignored. The Nissan boomerang headlight and jet-like D-pillars add a sense of class that is easy to love, making the Murano design a force to be reckoned with in its segment. If you’re interested in seeing this new standard for yourself, make sure you stop by Cronic Nissan today! For the 2015 Nissan Murano, the design engineers working on the third-generation SUV set out to completely re-think the entire vehicle. High on the list of priorities for this team, a striking new design and impressive aerodynamics were the main focus from the beginning. Now that the Murano has been completed for the upcoming model year, Nissan is showing off some of the work that went into designing this masterpiece. The first thing that hits you when you look at the new Murano is the sporty and futuristic look of the vehicle. Headlights and taillights similar to the “boomerang” design first introduced on the Nissan 370Z have actually been slimmed and stretched to an even more extreme extent. Sitting right up front is Nissan’s new V-Motion grille which features aerodynamic shutters that close to increase efficiency and open to cool the engine. Around the back is an integrated spoiler that helps reduce drag and an innovative D-Pillar design gives the appearance of a floating roof. Even more impressive is how all of the unique features work together to give the Murano a drag coefficient of .31, better than some sports cars! For more information, stop by Cronic Nissan in Griffin, GA today or check out the video below. Beware though, it’s in Japanese with English subtitles. Everyone has heard about the incredible Nissan LEAF fully electric passenger vehicle. The incredibly efficient, zero-emissions hatchback has changed the way drivers think about electric-powered cars and has opened the doors for other mass-produced alternative fuel vehicles. Well now, the EV segment is about to get another addition. 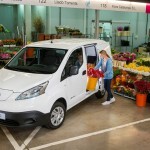 Produced in Barcelona and set for export globally, the new Nissan e-NV200 modifies the existing NV200 cargo van with an all-electric drivetrain. “This is a great landmark day for Nissan, starting production of our second electric vehicle. This is at a time when EVs are now recognized as mainstream technology. Many competitors are only just starting to launch their first EV – where Nissan has clear first mover advantage. We’re proud that the Nissan LEAF is the world’s best-selling electric vehicle with more than 110,000 delighted customers enjoying the quiet and smooth ride of an EV.” Said Andy Palmer, Chief Planning Officer at Nissan Motor Co. Ltd.
For more information about the e-NV200 or the currently available Nissan LEAF, visit us today at Cronic Nissan in Griffin, GA.
Nissan is making driving with tall passengers a whole lot easier with the introduction of the Smart Rearview Mirror, a safety technology that uses an LCD monitor to provide clear reward visibility to drivers. While this new rearview mirror has yet to be introduced in a production vehicle, it’s already making a huge splash in the industry by being named a 2014 Traffic Safety Achievement Award recipient. Along with being a conventional rearview mirror, the Smart Rearview Mirror provides the driver with a crisp, clear image with a high-quality camera and image processing system that produces an image with minimal glare. The driver can even switch between the traditional rearview mirror and the LCD screen as he or she wishes! The Nissan Smart Rearview Mirror is set to release in Japan this spring with a global release happening soon after, so make sure you keep an eye on the dealer lots at Cronic Nissan for this awesome new technology.